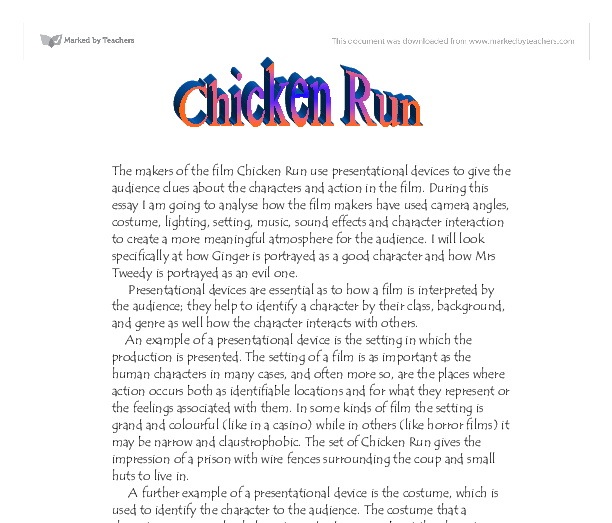 Chicken run - During this essay I am going to analyse how the film makers have used camera angles, costume, lighting, setting, music, sound effects and character interaction to create a more meaningful atmosphere for the audience. 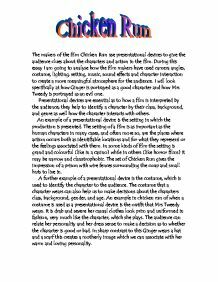 The makers of the film Chicken Run use presentational devices to give the audience clues about the characters and action in the film. During this essay I am going to analyse how the film makers have used camera angles, costume, lighting, setting, music, sound effects and character interaction to create a more meaningful atmosphere for the audience. I will look specifically at how Ginger is portrayed as a good character and how Mrs Tweedy is portrayed as an evil one. Presentational devices are essential as to how a film is interpreted by the audience; they help to identify a character by their class, background, and genre as well how the character interacts with others. An example of a presentational device is the setting in which the production is presented. The setting of a film is as important as the human characters in many cases, and often more so, are the places where action occurs both as identifiable locations and for what they represent or the feelings associated with them. In some kinds of film the setting is grand and colourful (like in a casino) while in others (like horror films) it may be narrow and claustrophobic. The set of Chicken Run gives the impression of a prison with wire fences surrounding the coup and small huts to live in. A further example of a presentational device is the costume, which is used to identify the character to the audience. The costume that a character wears can also help us to make decisions about the characters class, background, gender, and age. ...read more. An additional presentational device used in this scene was the silhouette effect, which made Mrs Tweedy look more evil this also made the audience feel sorry for the chickens When Rocky enters the frame Ginger sees him as her ticket out of the coup. Rocky is portrayed as a hero because the makers of Chicken Run dress him up in bold clothes so that he stands out from all the other chickens and this also makes him identifiable to the audience. Rockys American accent also adds to this. He is almost the American heartthrob that appears in teenage romance movies. Ginger however, is portrayed as feminine when she falls prey to his masculine charms. When Rocky flies into the coup all of the chickens stand back in amazement and Rocky accepts his plaudits but then Ginger shows her imagination and vision by asking Rocky if he can teach her and the other Chickens how to fly. Rocky straight away jumps onto the offensive by refusing to have anything to do with Ginger's scheme. But as they approach the wire fencing and Rocky is about to take off and fly away the guard dogs see Rocky and start barking. Ginger and Rocky then dart off to the other side of the coup where they both overhear a conversation between the manager of the circus where Rocky came from and Mrs Tweedie. The manager of the circus says to Mrs Tweedy that Rocky is very valuable Mrs Tweedy then says that she will do all she can to find Rocky while she is saying this the camera slowly starts to zoom in on Mrs Tweedy and her eyes start to glow devilishly. ...read more. Then all of a sudden as, the crate is about to take off, Rocky appears on the scene Ginger then shows two different types of emotions towards him. First she slaps him for going away without saying anything. Then she kisses him for coming back. Meanwhile the evil Mrs Tweedy has caught sight of the crate and she chases it and clings onto the end of it. By this time the music is playing at a high tone and at a fast tempo the tension is also at it's highest. Mrs Tweedy then tries to kill Ginger but she misses and cuts the rope. Mrs Tweedy's face turns from one of jubilation because she thought she killed Ginger to one of sheer horror as she realises that she has cut the rope instead of Ginger's head. The music then changes from a dramatic tone to a jolly tone. Then as the realisation of escape starts to dawn all the chickens are shown to be dancing around and hugging each other and every one is in a jubilant mood. Ginger then kisses Rocky as a sign of relief. After studying Chicken Run in detail I have learned that what makes a good film is not just what happens but it is about the way in which the film is presented. I have also learnt that there are many ways in which films can be presented. I have also learnt that costume isn't just used to prevent a character from being naked but in the case of animals it can be used to both humanise the character and make it identifiable to the audience. BY James Bevens ...read more. She at once redoes her lipstick that is already heavily applied and fixes her bleach blond hair, which extends the idea of her being a femme fatale. At this point Walter has followed Phyllis to the mirror and has stared at her every move. "Spies", though one of the most effective ones being memory and perception. This theme is significant in the novel as it shows the reader the different perceptions dissimilar people can have on the same subject, for example a child's view of the world is very different to an adults. As he touches the car an alarm goes off. The sound is so exaggerated it shocks the audience and really gets the adrenaline pumping. The effect of showing Jim through the car window also means we can see his reaction. The fact that the old man laid there dead for several days without anybody knowing about it showed that he was alone and had no family to care for him. This showed that loneliness is an important issue for elderly people. When the three men reach the train a tracking shot is used and the camera is inside the train. This makes the audience feel that they are sitting on the train watching the three men trying to climb into the compartment. Usually the evil character is the least expected by the audience in order to shock and surprise the viewers. After the dramatis personae list of voices, comes an unexpected, yet rather predictable move. A sign warning "Beware, Ogre," Shrek takes a pride in his work of art, which is a smiling Ogre to finish of his sign. I would have all the hall looks as if it had just being renovated by having some wooden scaffolding around block stair for the chorus this would also suggest he has recently come into power as Oedipus has just passed away therefore he has taken over the palace.